ISLAMABAD: Top military commanders believe that the terrorist threat is transforming because of a growing nexus between hostile actors in the neighbourhood and ‘facilitators’ within the country. 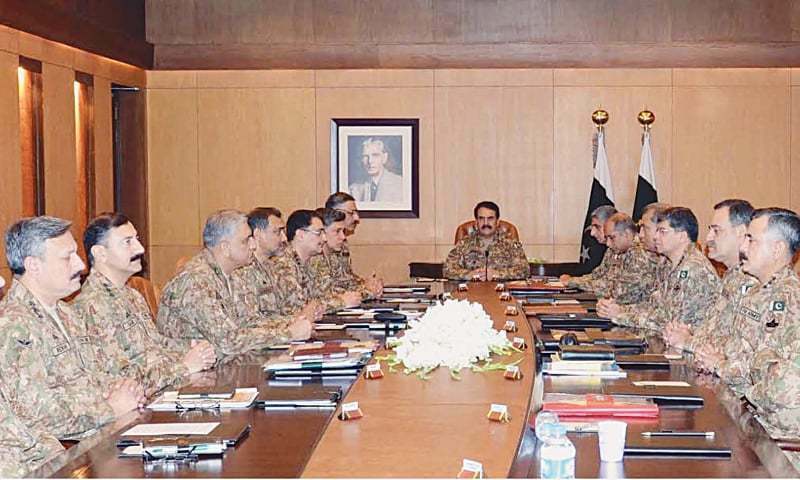 At a corps commanders’ conference held at the General Headquarters on Tuesday, the generals reviewed the threat perception and discussed measures for countering the imminent security challenges. “Participants of the conference were given detailed briefings on ongoing military operations and overall external and internal security situation in the country with particular reference to counterterrorism domain,” the ISPR said in a statement. The meeting, a monthly feature, gained added significance because of the terrorist attack in Quetta a day earlier, which left at least 70 people dead, and an upcoming high-level security meeting that is expected to take important decisions with regards to future direction of counterterrorism operations. Army Chief Gen Raheel Sharif told his commanders that the Quetta attack was an attempt to undermine the successes of operation Zarb-i-Azb, which is in its final phase. 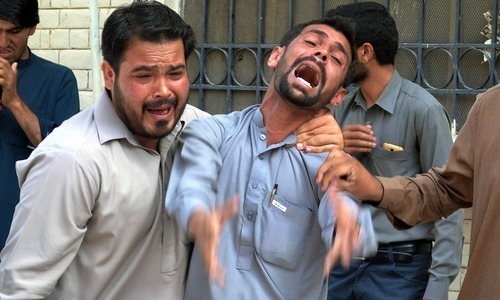 He had said on Monday that the target of the attack was the China-Pakistan Economic Corridor. “By adopting a whole of nation approach, the armed forces would not allow anyone to reverse our gains against terrorism,” the army chief added. At the conference, the generals were told that threat was emanating from Afghan soil, which was being managed by Indian intelligence agencies. However, at the same time there was an acknowledgment that a network of ‘facilitators’ within the country provided an enabling environment for the external enemy. It is unclear who the facilitators of the external enemy are — whether they are extremist and terrorist organisations operating within the country or other anti-state elements? During his visit to Quetta after the suicide attack on Civil Hospital on Monday, Gen Raheel had ordered intensification of the already under way combing operations against terrorist groups and their sleeper cells. He further directed expansion in the scope and spread of the operations. “The military and intelligence agencies have now been mandated to go after the terrorists anywhere in the country, … wherever there is a clue,” a security source said. The commanders were told that the countrywide crackdown had begun to get hold of the facilitators. Furthermore, there was a recognition that civilian law enforcement agencies needed to be enabled to extend a helping hand in the fight against terrorism. The ISPR said the commanders had been directed “to provide all necessary assistance to provincial LEAs in their capacity building through training, resourcing and planning so as to integrate them effectively in counterterrorism operations”. There has been criticism that counterterrorism operations are being constrained because of inadequate involvement of the civilian LEAs in the provinces. Prime Minister Nawaz Sharif had at a security meeting last week also stressed supporting the provincial LEAs. “The gains in the National Action Plan and operation Zarb-i-Azb, and progress achieved so far will be consolidated through well coordinated and concerted efforts at the federal and provincial levels with the backing of the national resolve,” PM Sharif had said. Great! Identify the threat and then eliminate it! Question remains the same what would you do with the enemy who is operating across the border using Afghan soil ? China's grand strategy for Asia is being undermined by nexus between India and US , Pakistan and China should jointly chalk out strategy to secure CPEC infrastructure and enhance the pace of CPEC rollout, China should put pressure on India on its eastern border so that it does not have enough resources to pursue its activities in Afghanistan and along Pakistan border, siezing Kashmir territory should be part of this game plan , once India looses Kashmir it will pave way for other separatist movements within India to gain strength and achieve success. While army is doing a good job, it is hard to understand what the civilian government is doing except corruption. Start from Basics. Local Police need to be empowered and integrated with domestic intelligence network. Local Thanas need to be told to collaborate with general population so timely information about suspicious activity can be monitored, recorded and communicated to higher authorities for timely action. How can the operation be in final phase when so much of death and destruction still going on? I don't agree, and thanks God in the age of information we are no longer in 80s era to blindly believe what you say. The people of Pakistan are now aware. The security institutions have failed to protect its people from internal and external threats. You must change your policies. @SR , They will complete the final phase and then they will rest .. No matter what happens there after..
My brothers and sisters in India and Pakistan we must stop this mutual destruction path. It's not helping anyone. We can't hurt each other, we the common people love each other and share our pain together. This must stop if we need to become 1st world. @SR Isnt CPEC also supposed to be done by 2030? How can anybody solve the problem, if the problem definition itself is incorrect ? You will never be rid of terrorism unless you change your ways of differentiating between good and bad terrorists. As simple as that. @Basit Ali India's interference has firmed our resolve , we will now complete CPEC within 5 yrs . “The military and intelligence agencies have now been mandated to go after the terrorists anywhere in the country" Earlier it was not the case. @Amitabh We are working on CPEC ,the game changer in the region and beyond. So what is being done to counter this threat and secondly tell this to the world also through proactive diplomacy. Without India, Afghanistan and Iran on board, I can assure you that even after completion of CPEC its use would be extremely limited vis-a-vis its potential. @sana-1 what is cpec it will ruin your industry & your county will be flooded by chinese goods. This was all done to divert the attention of Ik March first they did APS and now Quetta.They should catch big crocs along with small fishes. .
@sana-1 Please reads indian news also there are thousands of projects like CPEC is going on India. @Amitabh India's real threat is from China. India should be grateful to Pakistan that the Indian military get real live combat training on India-Pak border which can have value during potential future conflict between India and China. Think. Think. If we dont stop categorising terrorists, many more Quetta are due. You blame me, I blame you. The great blaming game is being played since last 70 years. How long can they make us fools? Defence and Foreign Policy should not be entrusted to military men. Only solution is repatriation of all Afghans and completely sealing of border with Afghanistan. @sana-1 CPEC is not going to change anything, How can a road change the fortunes? Please do not depend on China for your future. Why not China has opened industrial complex in Pakistan? Manufacture goods in Pak and send it through Gwadar port. rather it has made a road. Please have good relations with your immediate neighbour, develop business ties with India, It would be wonderful to have Tatas , Reliance and Adani ,opening the manufacturing hubs in Pakistan. Modi came to Pakistan last year to start business relations with Pakistan. Dare to accept the facts, let's come face to face and mutually agree upon not to kill each others innocent people. A pipe line of gas will connect India to Iran via Pakistan. In one hand Pakistan is helping India to meet its fuel demand. Now with no answer or proofs when other Organization are claiming they did attack. Credits of attack are given to someone else, there are other agreements of trade in pipeline. Why facilitate merchants and industrialist of country and also blame it. Hope readers after cool mind have their conclusions. Please stop this and catch the both the good and bad Taliban. enough is enough. @Abdul Majeed ...great we are with you..
@Akil Akhtar ,this is for the masses to understand who are in the habit of casting their vote without thinking with the result that the whole country pays the price. Can someone help me understand how exactly the attack against the lawyers in a hospital be related to CPEC? @ali ghous , then what is the problem with CPEC, be content and happy with your own development, live and let live. @Khalid ......I am an Engineer working on CPEC and let me tell you that an impossibility is being turned into a reality. A similar impossibility at a smaller scale was also jointly carried out by Sino-Pak Engineers way back in 1970s when Karakoram Highway was completed. For your info the work on Karakoram railways has also started. Thanks for your concern. We have not seriously considered India or Afghanistan as part of CPEC business and will be better off without these. I wish there was option to change such neighbours. Vast majority of the people on both sides want to live as peaceful neighbors just like US and Canada, or countries in EU, why can't both India-Pakistan realizes that one country failure is not another's success. It is just the 2-3% hawkish, egoistic, and hindsighted elements in both the countries who want a permanent turmoil and engages in war mongering. When we will realize it's the region which develops and prospers, if Afghanistan is in turmoil it effects Pakistan and it trickles down to India and the whole region...Let's talk and engage like grown up neighbors. @Shaukat Ali Khan , Good wish. @Angry Pitbull .....Nothing of the size and importance of CPEC, besides China, Russia and Central Asian states are also proposed users. @Swamy ....Chinese goods are already flowing into Pakistan through Karakoram Highway for the last 40 years and Pak goods are going into China without bothering anyone. All calm and comfort prevails wit the trade. @AUGINPK .... India, Afghanistan and Iran do not disturb the configuration of CPEC in any way. The main users are Russia and China who are capable of removing all natural and artificial obstacles enroute. @Zak Well said and once made China can begin exporting their stuff to middle east who will then overcome their slump in economy ! @Shafi You are right and a state/people who believe such claptrap are truly doomed. For solving a problem you need to identify it rightly first. @Kashif Sadly sensible people like you are in a very small minority. The rest of the people are brainwashed to believe every thing they read here. @Shah Saab What prosperity did Karakoram highway bring to Pakistan? Maybe it benefited only some business men in Punjab ... but what about Gilgit/Baltistan? CPEC would be no difference. All the comments and accusations are on expected lines. I am relieved. The world is not changed. Imtiaz it is not mutual destruction but self destruction by Pakistan. Pakistan is stuck in the past and has made its raison de etre to create trouble in the name of Kashmir. Pakistan needs to get the reality and be part of the world. @Shah Saab - I recognize the CPEC is important to Pakistan, and respect that. But to say that there is nothing on that scale taking place in India is meaningless. Just so you get a perspective, the CPEC project scheduled for completion by 2030 will be worth some $46 billion. In contrast, infrastructure projects scheduled for completion India in just the next 5 years by the Indian Government is worth $1 trillion (that is right, 1 trillion, which is 21 times 46 billion). While we wish Pakistan well, why should India be worried about such as small project in Pakistan, when such massive investments are taking place in our own country? In any case, we would like our neighbours to prosper, because that will only benefit all, and there will more peace. The military leadership lacks the vision to handle some political maneuvers, while the politicians is a bunch of corrupt and incompetent lot. The best political strategy could be stop interfering in the internal matters of Afghanistan, assure this to Afghans, extend hands of friendship towards them to counter the ever-increasing Indian role. India is winning their hearts and pockets by doing welfare works like building roads and bridges. Let us also work in this area which will reap real fruits for our beloved country and our Muslim neighbors. @WorldView .... you need to visit the area! @Manik CPEC stands for China Pakistan Ecomonic Corridor. China is investing a major chunk of 46 billion USD in power projects, in coal based projects, in RLNG based power projects and in nuclear power plants of 2x1100 MW near Karachi, many of them will be completed by 2018, are on fast track. Also many industrial zones are being set up all along the route, that includes Gwadar industrial zone, many others, a 1.5 billion USD knowledge park near Lahore so on and so forth. @Zak Wishful thinking, but without substance! You can blame everybody else but without proof its all talk. Why should people believe you. “The military and intelligence agencies have now been mandated to go after the terrorists anywhere in the country, … wherever there is a clue,” - why was not this the case before? Why was the response to terrorism limited? @Swamy don't worry. Pakistan won't be flooded with chinese goods either. It would be flooded with Chinese military. Witness modern day colonization and learn. Learning is of supreme importance for us Indians. @Rajesh again the minorities would feel the heat. @Amit Sharma: Thanks for your comment - good to see a few like you who can question their establishment. WE have plenty here in Pakistan. If people from both side of border start questioning their respective establishments, things will be much better !!! Every attack makes them alerted that shows how much relax they become. Major problem is of these facilitators.If our own people will betray us how can we move on.. So we need to root out these sleeper cells and this can only be possible by quality education, jobs availablilty specially in Baluchistan, KPK and FATA tribal areas etc..
@Khalid It may be happening, but who will ultimately benefit? Pakistan or China? The Chinese are not exactly known for their kindness and generosity. You will be paying a very high price for the loans you take for this project. @Zak Good imagination, however the fact is, Its U.S and India which is putting pressure on both China and Pakistan and so far we have been successful in isolating Pakistan, same is going to happen with China as well. @Zak lol...u talk like its something new u r putting here :P this is what exactly pak has been trying to do for 50+ yrs. but in vain. Do u relly think indians are that dumb to not understand pak fitrat even afyter a partition. Nothing good will happen until the police and other law enforcement agencies are completely and totally depoliticized. @Manik Resolve the problem of Kashmir according to the wishes of the people of Kashmir as promised, and then see a boom in trade relations between Pakistan and India. @Amit Sharma modi's govt looks frustrated and Kashmir is burning why is Kashmir burning you tell me.His policies have failed .Well if you call record FDR since 2014 a failure than you have no knowledge of current situation in economic terms.Projects which were stalled during last govt are up and running again and nearing completion.The GST bill which had stalled for years has been passed through parliament.The country is moving onwards and upwards so please tell me what do you call failure? @Nathan Then why your leaders are trying to sabotage such a small project if India is not worried. Then why to go to Iran to develop a port to match Gawadar. China and Pakistan understand Indian intentions very well and it is better to work together regionally then trying to sabotage each other's development projects. We have learned hard lessons aligning ourselves with US and Indians will learn the hard way as well. Words are cheap, where is the proof ? For a quarter century the world is waiting to see proof of external dimension for even one terror incident in Pakistan. How long can the Pakistani citizens be fooled by rhetoric ? @sana-1 Cpec will be game changer indeed but for China as they can send their products to Africa and Middle East through a shorter and cheaper route. Does Pakistan get to send its goods to China in same way? Will Chinese market welcome Pakistani goods? The only benefit Pakistan is getting is transit fees and income for some service stations along the route. You will also benefit from Chinese goods which will have adverse effect on local industries. Good luck with that!cpec has been oversold to Pakistani public few years down the line there will be dissapointment and disillusionment. Everything will be solved if Police is independent and not under the control of MNAs and MPAs. Police and intelligence agencies are spending time on protecting these MNAs and MPAs. Please stop this joke from world war 1, world has grown much beyond and we still have these generals sitting in meeting rooms deciding our fate. At the conference, the generals were told that threat was emanating from Afghan soil, which was being managed by Indian intelligence agencies. However, at the same time there was an acknowledgment that a network of ‘facilitators’ within the country provided an enabling environment for the external enemy. So eliminate the facilitators within the country. This at least is in your approach. @Cosmopolitan "How can we blame others we don t have any proof". Because we want our people to believe that problem is not food, shelter, medicine, employment, education in our country that is created by our corrupt system, instead it comes from across the border as safety. We can't solve internal one so blame that. So easy. @Jamil You have to be very naive to believe all our differences will go away once Kashmir problem is solved and there will be complete peace in the subcontinent. Please stop dreaming. Next problem will be Siachen and after that it will be about water. Your army needs an excuse to stay in control. They will always find a new problem. Make them suffer.enough is enough!!! @Zak ofcourse i agree with you..this time china is more close to us than india to US even Russia too is with china and will co ordinate closely with us on behalf of china.pakistan must force Russia to fully co operate with us on defence deal signed in 2014 when Russian defence minister twice visited pakistan once in 2014 and then in 2015.now Russia too suffering by US and EU as a result of Ukranian crises.China Russia Pakistan must force US to leave afghanistan and let us deploy our troops in afghanistan..
@imtiaz ali khan - I agree 100%. There should be a people movement. bad policy Now India is ruling afghanistan.. n what are we doing ! @sana-1 Good. after CPEC, game will change vise versa. @Zak What a negative mindset..
@Nathan Well said . At least eye opener for the Pakistanis in the forum those considering the CPEC as one world biggest. Its really unfortunate, people 70 years back were the same country fought the british for 200 years, now falling prey to hatred. I don't think the Chinese have any good in their heart and will only hurt Pakistan. History will tell. @Khalid So intelligence. You know everything what CPEC is; because you are engineer at Germany. So please imagine what other engineers at US, UK, USSR and India would be knowing. @Ali Vazir very well said!!! Prosperity and development of our Region - south Asia - should be matter upermost! @Zak China's investment is staggered, its their pace which is pre-planned. Its not really about completion but about making it successful. @ali ghous Pakistan preferred its terror assets over friendly relations with neighbors. Do I need to tell you who is suffering from those choices made. For your knowledge, Kashmiris in Kashmir are only 15%. Other 85% languages and people and Punjabi, Dongra, Budhs, Pandits etc. Kashmir has 22 districts and only 5 are destabilize. @Timeto stopthis Seems like your geography is very poor. Siachen is part of Kashmir. Once the problem of Kashmir is resolved, so will Siachen dispute. Kashmir is the core problem, the rest can be resolved easily through dialogue. Stop blaming the Pakistan army. They are there to defend the territorial integrity of Pakistan and they are doing a commendable job. Check the facts, Chabhar Project was first or CPEC. India and Iran first agreed to plans to develop Shahid Beheshti port in 2003. @Swamy as if it is not ruined now. @Steel Economic collaboration between neighbours is a good thing as it brings economic prosperity to the people and raise their standard of living. History will tell that CPEC would turn out to be an immense success story benefiting both Pakistan and China and other countries in the region. Threat., threat, threat from within and out of Pakistan is being heard for a long time but who is going to rescue, people or AF or Some one from Heaven Can any body answer? @Jamil The threat is not to your territorial integrity but to your internal security. And sadly, until now they havent been able to do much to protect the people from all the attacks happening in your own country. @Reshma The people of Kashmir, regardless of their ethnic composition were promised a right to exercise their will to determine its future, which has been denied to them. Its time that right is respected to the people of Kashmir in order to bring lasting peace in the region. People don't worry Pakistan will overcome all its problems soon. In most countries only politicians play politics over dead bodies. To be frank, India is busy with its own growth targets and ofcourse with its own issues. India's priority is different and is not at all concerned with internal matters of Pakistan. If India plans to involve, this shall never be in the terrorist route. We always use the diplomatic options. It is extremely hard time. Enemies are attacking soft targets. Armcritics are active in spreading poisonous propaganda. I wish and pray that the state will eventually foil all nefarious attempt and will able to provide peaceful living to the citizens. @Timeto stopthis When you talk about territorial integrity, it means tackling internal and external threats. Pakistan at the moment is facing India inspired subversive activities inside our territory, which will be nipped in the bud very soon. Local police should be more trained to deal with terrorist problems and army should deal with overall problem. @Jamil First read the UNSC resolution points over Kashmir.....Whom to act and initiate first...? @Neutral Guy Yes the title may have been like this ,,, Threat emanates from India, Manged from Afghan soil. Generals told.?? @Zak Agreed 1198 percent. Sir. @sahid_kashmiri The UN resolution on Kashmir was accepted by both India and Pakistan. While Pakistan and the people of Kashmir wants its full implementation, India is shying away. Any reason why India doesn't want its implementation? That is why it is imparative to not only go against he facilitators within but also in parrallel uproot the Indian terror infra outside the borders of Pakistan. If some distant power like it or not, it shouldnt matter now, Pakistani lives are at stake here. Time to issue a notice to Afghanistan that if RAW operates from their soil, Pakistan has the right strike the Indians in Afghanistan in a manner Pakistan deems fit. There should not be any ifs or buts. @Neutral Guy, You must be reading with Indian glasses that is why you feel misleading. Once RAW agents are hit, you will see it clearly. The root cause of terrorism is mostly internal. As along as social injustices, deprivation, discrimination and unemployment continue, the external enemy shall find their facilitators very easily. Afghanistan should play it's part and keep Indians out of the rivalry between India and Pakistan. Very convenient. It also seems that Pakistan is never in the wrong. By the sound of it, we have perfect security services and we are perfect, then how come we have enemies? I am sorry but I don't buy these explanation. Not anymore. "Threat emanates from India-managed Afghan soil"
That is a pretty clear cut statement. No ambiguity in it. @Zealot I think, it is too late to have Russia as a friend of Pakistan. Russians was once in Afghanistan. On that occasion Pakistan had sided with America and the west. Now you want to chnage side? @Shafi "Can someone help me understand how exactly the attack against the lawyers in a hospital be related to CPEC?" It's the chaos and fear among ordinary people that terrorists use to attain other goals. If lawyers are not safe in Quetta, the capitol of Baluchistan, then how can any development be done. This is the mindset they are driving at. India was pretty open about it's stance against CPEC and these are just the tactics used to wage an unconventional warfare to achieve the goals. You may like to search for Ajit Doval's speech on youtube where he openly proposes funding anti Pakistan elements in Baluchistan. Kulbushan Jhadev was caught doing just that. @Akbar we have identified the disease but we cannot cure it.. cos.. we don't have the medicine. And what is the medicine political sagacity and farsightedness.. we dont think before we leap...We live in a world where unfortunately the distinction between true and false appears to become increasingly blurred by manipulation of facts, by exploitation of uncritical minds, and by the pollution of the language. @lafanga .. Anybody is free to make a statement. We Indians too made a very clear statement to Pakistan. We are providing consular access too. We always back up our statements with solid proof. @Neutral Guy ...indeed...How often misused words generate misleading thoughts. History goes back to 1988 When more than 120+ people were consumed and lost their lives in a terrorist attack in market place of Bohri Bazar, Safdar Karachi, it could have been in 1987. I was then serving in 5 Corps Headquarters Karachi. We were then not allowed to walk to Corps Headquarters under Corps Commander Lt General(Late) Asif Nawaz from Officers High Rise Twin Tower Apartments due to well assessed threat assessment that external terrorist had perpetrated that crime. It's a well known fact who are against existence of Pakistan and its peaceful economic growth and development. If we keep guessing and don't take serious punitive measures and action they will not refrain from such ongoing acts of terrorism. There sponsored sleeping cells are in places where the big money is? Not in the slums they use them to keep the nation confused. It's time to get hands on the big fish who are at odds with Pakistan's existence. Do it swiftly and quickly otherwise Pakistan's independence??? Kulbushan Yadav a serving indian navy officer was not walking around in Balochistan on a tourist visa. Too much emphasis on CPEC. If there is a CPEC or not our priority is to get rid of terrorism. Terrorism started before CPEC. I think Pakistani people will one day get sick of this word CPEC if concrete steps are not taken for their welfare and safety. There should be an all inclusive approach and everybody should work in their own areas of expertise and where things overlap proper coordination should be set up between organisations. Security forces should provide security and political parties should provide policies and government and private sector should create jobs. CPEC should be an opportunity for Pakistan not a lifeline. Citizens shouldn't act like a sitting duck and keep an open eye around and any suspect should be dealt with proper manner. These terrorists are not superhuman and can be tackled if all the people come together. One should confront even his/her brother if acts suspiciously. Turkish people have proved that if people come together they can change things. @Zak china is a mature and responsible nation. Plz worry about internal problems of Pakistan. This vicous trend of killing in Pakistan would continue unless authorities start handing down quick punishment to criminals. Why police fails to provide evidence and why many criminals not getting punishments? If this gradual destruction of pakistan is not stopped, than its destined to become Somalia. Those responsible might flea to other countries, but average pakistani will keep suffering for generations. Time to act, send a clear message to the people who hold the strings that enough is enough. PAK should not raise fingers on others instead set should its home right first. @SR .. you seem to be totally unaware of operation zarb-e-azb. It is happening is FATA areas which were safe heavens for terrorists and no go areas for Pakistani LEA. All that area is now cleared, all terrorist camps are destroyed and all terrorist groups have been neutralized or they have run across border to their afghan/indian guardians.. please educate yourself before shooting such ignorant comments! The problem is suicide bombers...and the source of the problem are the fanatics who create suicide bombers...Think about it...who does that?.. It is very simple and straight forward, the fire we started, and still openly support, which is called Taleban to burn Afghanitan, is now catching our own hands. @Raja Pakistan on its part is ready to implement the UN resolution in its totality, provided India is ready to do the same. The UN resolution called both Pakistan and India for a plebiscite to be held in the whole of Kashmir under UN auspices, so that the people of Kashmir could determine its future in a free and fair manner. While the people of Kashmir and Pakistan have agreed to the UN mechanism of holding a plebiscite, India is reluctant to do the same, as it fears that the people of Kashmir will not vote to stay with India. But India must realize that one day, it will have to bow to the wishes of the people of Kashmir. @Zak very well said. There are, I believe, 22 active seperatist movements in India which we must exploit. Easy to blame others and walk away from our own failures. @Joe king Very well said!! Why this bomber could not be stopped before making entry in Hospital. It reflects poorly on security situation. Improve security at public places just pointing fingers at neighbours won't work. Pakistan , Afghanistan, and india needs to sit and get the issues resolved. The killing of innocents be stopped at any cost. I think we are same people cor generation ns. It's only 70 yrs we got separated by British design. @sana-1 , Too much hype for nothing. It is going to be a one-way trade benefit to the Chinese for sometime and then abandoned like a hot potato. China is going into recession and deflation for a couple of decades. Learn from history of Japan overtaking USA in 70s that has been in deflation since 80s. Kashmir issue is solved by India and Pakistan through Shimla agreement and do not waste time and resource by talking again and again. Use resources for other purposes for better life of the people. Ours is a professional army that has withered many a storm. It's capabilities and capacities are beyond any doubt. Since launching the operation "zarbe Azb" in June 2014, our brave armed forces have gained substantial victories in fight against terrorism. They have broken the back of terrorists who are on the run now. However, recent terrorist attacks may require a review of the strategy and introduction of additional tactics to tackle terrorists in urban areas where they find soft targets. From beefing security to putting up more check posts in major cities together with giving additional powers to deployed forces could be another option. Regular patrolling and providing protection to sensitive public places may also become a permanent feature. Citizens need to be given guidance on what to watch and where. It is a long fight that God willing we will win by staying together. @Zak You are great are writing fiction. @ali ghous so why is Hindustan trying it's level best to derail CPEC? @Neutral Guy : Right, it should be "Modi active in Afghanistan"
@imtiaz ali khan My dearest brother, Indians do not believe in killing innocent or unarmed people, forget the thought. We do not gain anything by it, even if we gain anything by it we will not do it since it is a cowardly and cruel act. The tactless and inert political leadership is to blame for every ill. They were quick in legislating laws against martial-law, but failed miserably in making their own house in order. CEPEC is a threat to India because Chinese presence will be felt on the western border also apart from eastern border of India. Got it? Good steps but wrong direction!!! @Bol : Better rise from your slumber. CPEC is already in place in the entire northern areas since last 40 years. It is called Shahrah e Resham, the 8th modern wonder of the world, completed jointly with China! The new project started with China is its extension to Gwadar Port, in Arabian Sea at the Gulf. Army has made tremendous sacrifice for our country. I live in U.S. and the country pays so much respect to the veterans. And on the other side, our politicians don't miss a chance to hit back at Army. Were all the point mentioned above the responsibility of the civilian government or the military? There is a dire need of a homeland department on the pattern of that in US which was formed soon in the days after 9/11. The whole elements of counter terrorism force needs to be put under one roof and the COAS be put on top of that roof. @Parat Shimla agreement say to talk, but you do not want to talk about Kashmir. So how can you resolve the Kashmir issue. The problem of Kashmir will have to be resolved through dialogue between India and Pakistan by giving the right of self determination to the people of Kashmir as promised to them by both India and Pakistan and witnessed by the whole world in the UN. We are with you, Pak Army. @Zak good plan!!! how about a book or a movie? @Zak Good strategist. I hope both Pak and Chinese leaders read this. @sana-1 Pakistan's game changer should be the Pakistanis. CPEK is a 100% Chinese project that is primarily geared for Chinese interests. Pakistan will be a minor beneficiary. Unless you create it would be foolish to think that the Chinese will create something primarily for you. @Bol - Just so you get some perspective here. Last year, China and India did trade of $70 billion ($70 billion in just one year). That is bigger than the entire CPEC project which is totally worth $46 billion if completed by 2030 (that is in 15 years). Also, in just the next 5 years, there are investment projects worth over $1 trillion currently underway in India (that is 21 times the size of 46 billion). So, I can guarantee you nobody in India sees CPEC as a threat. In fact, most people in India have not even heard of the CPEC. I am sure CPEC is good for Pakistan, and I hope it works out well for you, but there is no purpose served in bringing India into it. @Bol China is not a threat to India bcoz Chinese r inherently a non-militaristic people. China is mature and responsible nation focussed on collaboration and never on collision. @Zak dream on. China knows where her echonomical interests lies. They are no ones friends. @imtiaz ali khan fully agree with you brother. Please covey this message to every one in Pakistan and I will do the same. what is the proof of such allegations? @Amit Sharma here is another Arundhoti Roy & Barkha Dutt. Good Luck! @Zak We should not stay under illusion of China. Soon China will walk away and we will be out without any defensive policy. India, Afghanistan and Iran are bigger and better markets for China than Pakistan. South China issue will escalate and the losses to China will be enormous to recover. We put all our eggs in one basket! They just found out Where have they been for last 10 yrs Good luck if that's the security services . Citizens Defence is the best Defence. Years of negligence of human capital development does not going to make things any better unless Pakistan start dialogue process with all neighbours & seek their support. China had very clearly told to discuss issues bilaterally. Also quickly review foreign policy compatiable with 21st Centuary.? @Zak ..By Banning Chinese items to be used in India will be more than enough for china....be sure that china will be neutral incase of kashmir or any war with india . @Zak yes, and USA will sit on the sideline and watch! India doesn't control Afghanistan. Please stop seeing everything with such paranoia. I rarely see any goodwill towards India, then how do you think of building any relationship between these 2 countries. @sana-1 - Do you really think that China will be able to do CPEC & OROB without taking India on board? India may not be as economically as strong as china as of now, but one cannot simply ignore india's interest in this area, whether anybody likes or not. @Amit Sharma In a village of peace loving 1000 people only 10 People having crooked mind can create havoc, similar thing is happening in Kashmir, If separatist feels they got people support then why they are not contesting election. @sana-1 CPEC will be only profitable for China. Pakistan's economy will be totally destroyed by this project due to cheap Chinese imports. Pakistani industry cannot compete with cheap Chinese goods. @Kashif Dear friend if someone puts neighbors house on fire, then he cannot expect himself secure from fire. That is natural truth. Then India and Pakistan should sign a friendship and cooperation pact - with complete cessation of all hostilities, Pakistan must give transit route for India to Afghanistan and Iran-Pak-India oil pipeline can also come. It will bring stability and prosperity to the whole region. Pak will also get Indian electricity. Trade with India will improve Pak economy rapidly. @M. Siddique Half of Afghan population is living in Pakistan...Indian are operating their covert activities via 17 consulates....time has come to give them an exit visa! @aslam shaikh1 Why India will want to derail CPEC? India is only protesting to not include Pakistani controlled Kashmir in CPEC, because it's disputed. 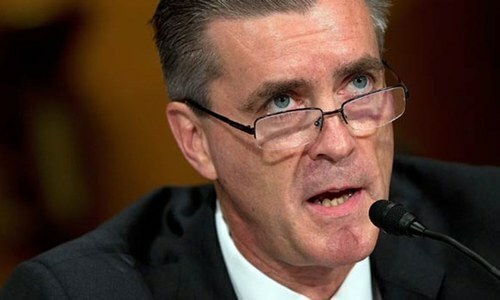 @Zak - India and US are not concerned with CPEC. India 's main focus is building internal Economic corridors. Everybody on both sides are looking through their glasses but reality is Kashmir for which both the nations along with the Kashmiris talk together and come to a firm conclusion at least in the next decade. but for this, PAK should not discuss with Kashmir leaders as it is considered by Indians as back stabbing. Govt of India or Govt of Pakistan are not corporate offices to talk any thing and do otherthing. They have the responsibility and accountability before their citizens. Hence, first PAK govt has to advise the Ambassador not to invite & talk with Kashmir leaders at least once so as to start the inter governmental dialogue. Then there will be a definite solution at the end; If PAK is not understanding the feelings of Indian Citizens then the problems between the two neighbors will long last without any solution. Both the govts. will have to spend money on unproductive work in the border and the people of Pak and India along with Kashmiris will have to suffer. May God bless all!!! India is and has been relentlessly busy even after 1971 to part Pakistan. Each and every Pakistani must realize this and do whatever to protect homeland. It is not the sole responsibility of armed forces - armed forces can protect external threat but what about the enemy within the Pakistan. As Kashmir is brewing with unrest it is time for Pakistanies to be more vigilant for India will try to divert attention from it. These cultural things and our actors going there are all small things to make Pakistan believe that India is our friend and well wisher. I read a number of comments here booasting about CPEC. Here's my view - The project means two different things to both countries. For Pakistan it's a growth engine. For China it is a strategic alternate route for sea port access in case of South China Sea blockades. Also CPEC connects the unindustrialized East China to a port which may or may not lead to major goods exchange. @Shaukat Ali Khan 800 poor pakistani died for this project. Only 10 chinese died in karakoram project. After all karakoram has not worth of the sacrifice in terms of business. @Akbar The only threat in Baluchistan is INEQUALITY AND NOTHING ELSE. @Amit Sharma you have very limited knowledge bhai or may be you are ignorant. Use google if you can. The same thing happened in 2008 and 2010. And it was worst than this. You don't even know how bad it was before because so far none of the previous govt., challenged and confronted the separatists, militants and terrorists in a way the Modi govt has done. So please don't spread false information. We are seeing this mess because previous govt ignored the root cause of Kashmir problem which is article 370. @Amitabh Your comment is partially correct, India maybe developing more than Pakistan but India still leads the world in poverty, what kind of development are you talking about? If people are still starving and homeless, that development has no value. And one more thing, India is 10 times bigger than Pakistan, that means more resources, ONE BILLION PEOPLE AGAINST 180 MILLION, hardly fair, but still, you cannot just come and stump on Pakistan, you know it, understand it, and will never dare. Pakistan's problems lie within but tries to find reasons outside.